11/02/2018 | News | Zwimpfer, L.
Psychodynamic Interventions in Pregnancy and Infancy: Clinical and Theoretical Perspectives. Originally published: 2018. Author: Björn Salomonsson. The perinatal period can be fraught with worry; the worries of babies, caregivers, and professionals who come into contact with them. 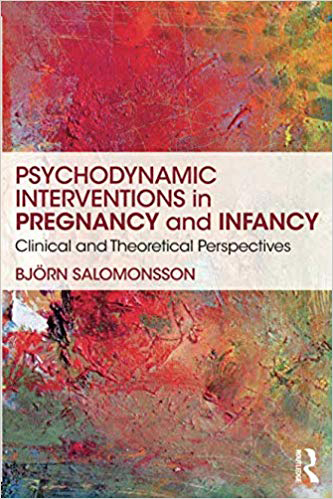 In his latest book Psychiatrist and Psychoanalyst Björn Salomonsson shows us how ‘baby worries’ can be safely brought out into the open and treated in a truly integrated way. This book is in equal parts; both an explanation of technique and a sound theoretical perspective on work with infants and their parents. Salomonsson is firmly ensconced in a child health clinic, where he provides psychoanalytic consultations alongside nurse-provided general health support. He offers supervision and support to the nurses who are then more equipped and psychologically capable of recognising baby worries in the families they see. With an approach that is both educational and supportive, he offers the nurses words to try out with families – a flotation device of sorts to help them navigate the deeper waters of emotion. Salomonsson has gained the trust of the nurses he works with so that together they are able to offer the families of the child health centre an extraordinary service. Just as infant mental health is concerned with the physiological as well as the psychological, so too should interventions in the perinatal period be seamless across both realms. Rich clinical case examples, theoretical concepts and research are used to highlight key phenomena in the perinatal period. Complex psychodynamic concepts are presented in an extremely digestible way. While he uses metaphor and imagery to come closer to and create a shared space with his clients, he also uses metaphor and imagery in his writing; the readers feel as though they are both literally and figuratively on the same page as him. Of particular note is Salomonsson’s description of the internal frame of his work. He considers it to be a mode of thinking in which he ‘reads between the lines’ or ‘understands unconscious currents between conscious messages’ (p.78). He describes beautifully how he holds both the roles of ‘unmasking’ and ‘translating’ alongside compassion and non-judgement in his technique. He has created a kind of psychological play-space that exists between supportive work and psychoanalysis. This feels so appropriate when the therapy takes place in a medical clinic and when working with parents who are simultaneously meeting the practical needs of a baby while also trying to reach and understand complex psychological dynamics. He takes a position in child health consultations which departs from the classical psychoanalytic one; he answers questions yet always analyses the impact of his words. He offers ‘pop up comments’ to facilitate an exploration below the surface, though cautions against going deeper if the patient is unwilling to participate. Salomonsson provides a thorough review of clinical methods and research in psychodynamic therapy with infants and parents (PTIP), particularly noting whether differing methods address the baby in therapy or consider the baby to have an unconscious; he utilizes both approaches in his own work. He ends the first half of the book with fascinating case examples of his work with couples and toddlers. The second half of the book focuses on theoretical perspectives. He asks whether the baby’s mind can be understood best through empirical observation or speculative theorising and concludes that analytic theorists and learnings from psychodynamic therapy with parents and infants have an important place alongside infant research and infant observation. Salomonsson reviews analytic models of infant anxiety and applies them to case studies before making a compelling argument for gaze avoidance as a defence against mental pain. He stresses the importance of conceptualising what happens inside both the mother and the baby – not to lose the insides of the baby to a focus on dyadic interaction. He argues that observation of dyadic interaction does not ‘give full credit to the baby’s subjectivity’ (p. 201) and describes his technique as both inter-subjective (based on communications between mother and baby) and ‘intra-subjective’ as he attempts to understand the psychological experiences of himself, mother and baby. It is also clear that Salomonsson encourages the nurses he supervises not to lose their insides in consultations with families. In a fascinating discussion of the use of metaphor in parent infant therapy, Salomonsson shows us how useful metaphor can be in a context which is ripe for transmission of infantile material. He suggests it is a helpful technique for when the therapists own infantile helplessness is awakened, provided the therapist can keep a hold of his/her own ‘narcissistic preoccupations’. He ends with a vision for the future as he makes a strong argument for having a ‘competent psychotherapist’ available at child health centers. I will return to this book again and again and consider it to be essential reading for any parent infant therapist, especially those who are responsible for supervising primary health professionals, upon whom we are dependent for recognizing the baby worries in the first place.